Search through our directory of various types of salvage yards to help you find the parts and components that you need; salvage yards are great for DIY-ers, thrifty repairs, fun project cars, and more! Vehicle salvage yards do not have to mean a dump of undriveable hunk of metal wreckage. Many salvaged cars can be restored to working condition without too much effort and expense. There are various categories of vehicle salvage, based on the level of damage to the car. 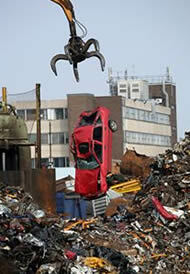 Category A vehicles are the stereotypical heap of metal salvage and are only useful for certain types of parts. Category B is still considered undriveable, but enough parts can generally be salvaged to resell at a profit. The first level of salvage where the car may be repairable is Category C. There is still extensive damage at this level, but it can be fixed. Category C salvage vehicles are still usually a money loser unless you can do significant parts of the work yourself. You may get halfway through the repair job and realize that you are better off just salvaging the vehicle for parts. Category D means that the vehicle is repairable and that the repair costs will be less than the sale value, ensuring you make a profit on the transaction. Category X vehicles are basically undamaged and have simply been stolen or unclassified as salvage as the result of being involved in an accident.